On our 20th wedding anniversary in 1999, we returned to Tahiti, where we had gone for our honeymoon. I discovered there were no fabric stores on the main island of Tahiti ... certainly not any on the smaller islands either. 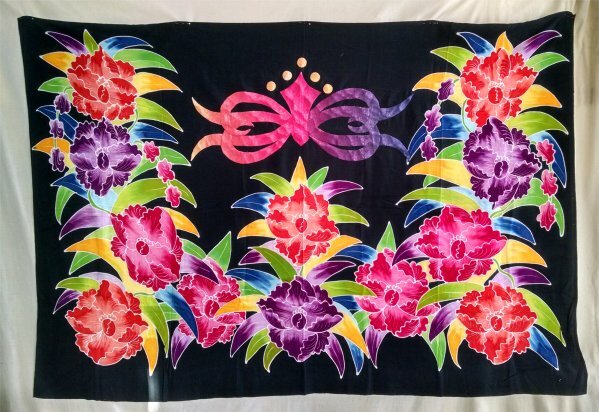 But, the one fabric item that was in abundance were pareaus ... the Tahitian version of a sarong. 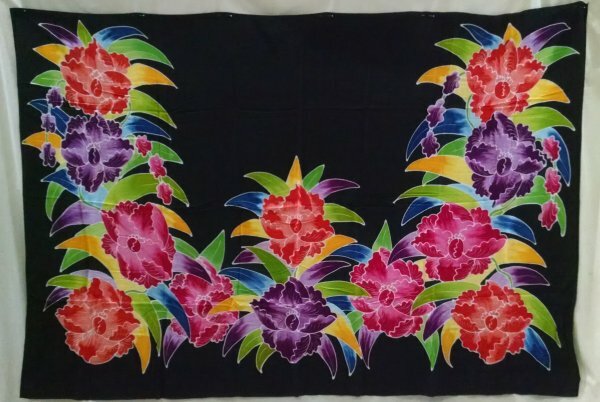 I chose a dramatically colored black pareau with vibrantly colored tropical flowers around three sides. 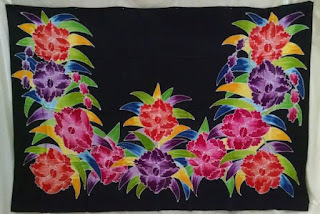 I suspect that the flowers were wax-resist batik, as they aren't screen printed and they aren't machine printed onto the fabric at all. Now, it was never my intent to WEAR the pareau ... I don't wear strapless garments. 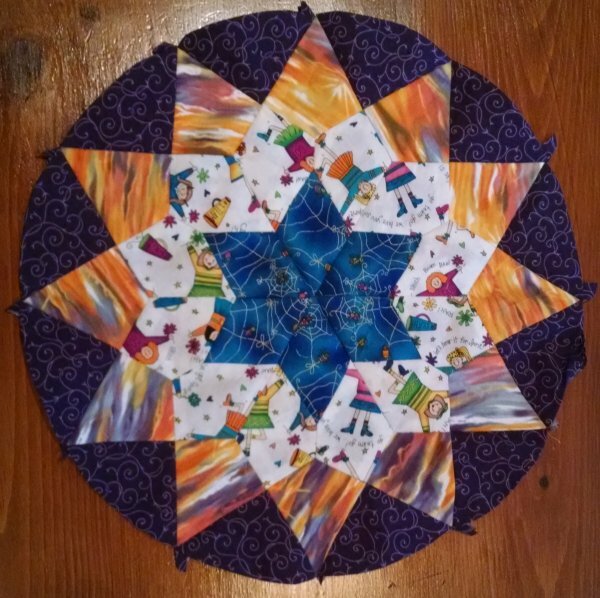 :-) I envisioned this as a lap quilt. However, I did want to put "something" in the black area, as otherwise it just looks like a void. I had no idea what that "something" would be, so I waited. And waited. And waited ... for the right "something" to hit me between the eyes or make its way known to my consciousness. My patience was rewarded! 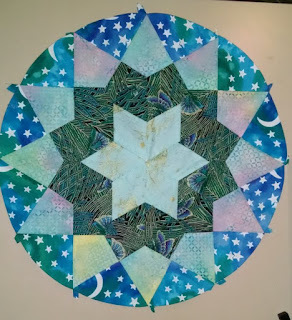 In 2013, I was incredibly fortunate enough to take a class with Nancy Lee Chong of Pacific Rim Quilting Company. 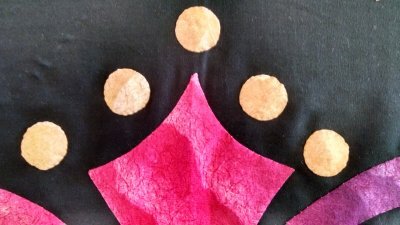 It is her version of front-basted applique that made me come to love-love-love needleturn applique. At the class, I bought another pattern from her (and had her autograph it! OOOH!!! I'm such a fan girl!) which was for a tablerunner ... or a border. There was also a subset of the applique suitable for placemats or a small wall hanging. It was the small wall hanging motif that eventually caught my eye to fill in the black area of the pareau. The pattern is "Crowning Glory". 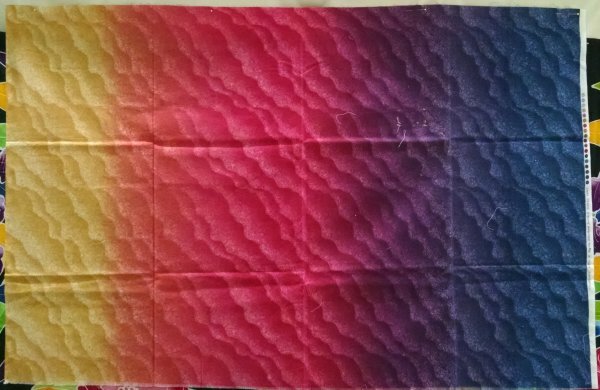 I already had on-hand an incredible yellow-to-red-to-purple-to-blue gradient fabric. It fit *perfectly* with the amazing tropical flower colors. 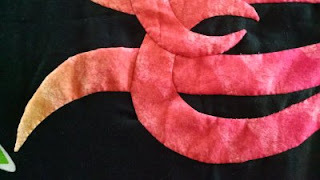 It took me one afternoon to do the prep work for the applique. I began stitching on January 10, 2017 and finished on February 22, 2017. I wasn't working on it all the time, which is why it took as long as it did. 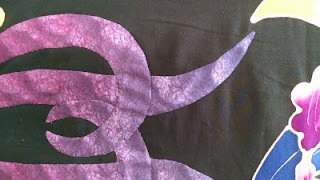 As I stand back and look at it, I am so pleased with the colors of the applique. I do wish, however, that I had placed the applique slightly higher and upon closer (much closer) inspection, I didn't put all the layers in the same position on both sides. I *thought* I was being careful, but apparently not. In any case, it is what it is, and there the applique will stay. 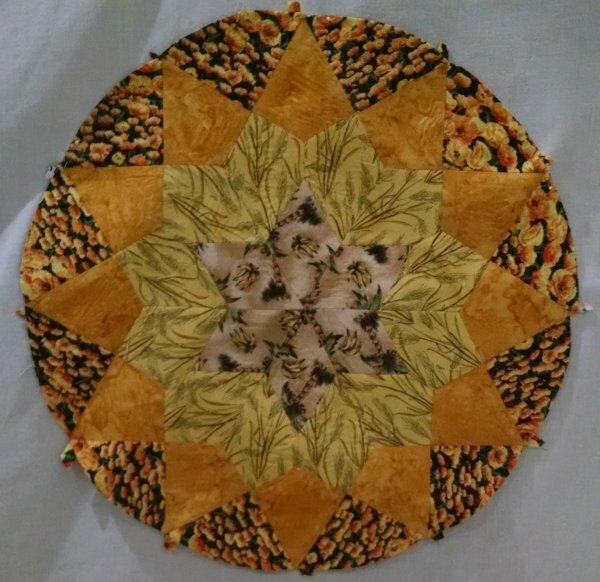 Now, it goes on the pile of Tops to be Quilted, which is getting higher all the time. 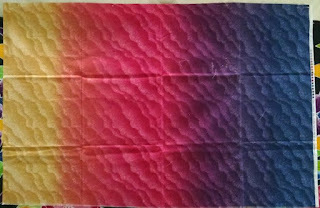 Every February, the online quilting forum group I belong to has a real live quilting retreat in Phoenix. This year was our 15th gathering. 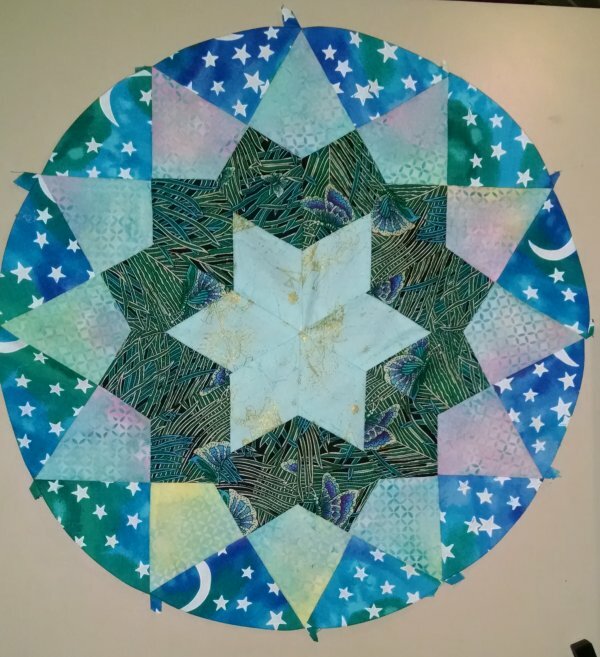 Over the years, we have forged true friendships online and while some of the members live in Phoenix and see more of each other than the rest of us, it is something that we always look forward to ... quilting with each other in real life. Because I fly in from California, I rarely bring a quilt for show-n-tell, preferring to bring in smaller items that will fit in my luggage. Similarly, I don't bring in my sewing machine ... not even my Janome Jem Gold, which was designed for traveling and workshops. The hostesses *very* graciously offer their extra machines to us out-of-towners to use, should we want to machine sew a project. 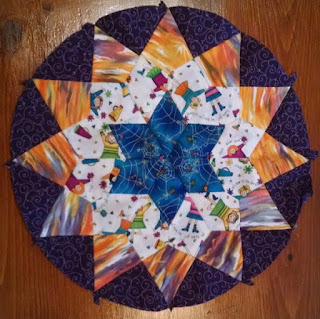 But even THAT is too much effort for me .... egads, I need to pack ALL of the piece parts, ALL of the fabric I want to use ... even the fabric that I'd like to have an option to use. Plus all my tools of the trade for sewing. Ugh ... it's just way too much effort for me to bring along a sewing machine project. 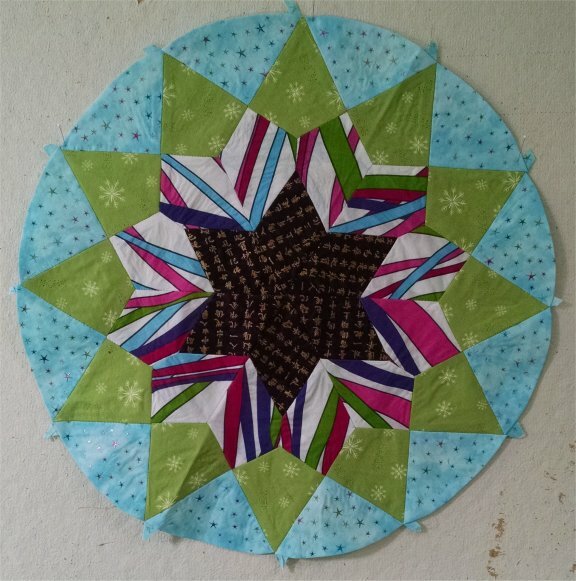 One Forever Project is smooshing together medium sized hexie flower units, which will end up as the center medallion of a quilt. 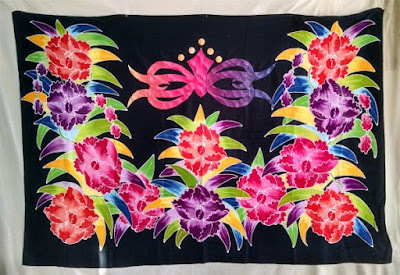 Another Forever Project is a needleturn applique of a Tahitian pareau (sarong) that I bought for the express purpose of turning into a lap quilt. In looking at my collection, I think I have an overabundance of blue stars, not that is a bad thing but I think that some more red stars could be in order.